This year marks the 10th anniversary of the COPD Foundation, an organization that fosters the search for new COPD treatments. This column attempts to monitor the treatment/research pipeline and perhaps draw attention to our needs. In 2009, a review was conducted of the state of COPD research based on information obtained from industry.1 Of a total of 37,000 agents in trials of one type or another at that time, 3.2 % were classified as being active and in the area of respiratory or pulmonary. At that time, the search term COPD brought up 617 ongoing interventional trials on the ClinicalTrials.gov website. In February 2014, the corresponding number of COPD trials was 780. Due to differences in the search methodology, the number of COPD trials today is probably not significantly greater than it was 5 years ago. The proportion of trials in phases I, II, III, and IV in 2009 showed a slight preponderance for phases II and III, and that remains the case. However, a large proportion of COPD studies do not provide a phase number. The National Institutes of Health (NIH) was the sole or joint sponsor of 29 COPD trials on ClinicalTrials.gov in 2009; today the corresponding number is 39. It would seem from these numbers that research on COPD has remained at a fairly low level, especially when compared to the number of clinical trials in other areas, as discussed later. The overall number of clinical trials is only one way to gauge the size of the research into COPD. There are other ways to consider. The number of new treatments is relevant. Ignoring the repetitive me too’s for the present and restricting this metric to new devices, new treatment modalities and new classes of agents, the list is short. There are some airway valves, coils, and biologic methods of reducing lung volume. There is one entirely novel delivery device, Respimat Soft Mist inhaler (Boehringer-Ingelheim Pharma GmbH &Co, Germany), and some new and highly efficient nebulizer devices. But there is only one new clinical entity, the phosphodiesterase 4 inhibitor, roflumilast. Are the numbers of COPD treatments consistent with the size of the COPD problem? What factors should guide where clinical research would most effectively be concentrated? If it were the impact of a disorder, the third most common cause of mortality (and rising) would be accordingly placed. COPD would deserve to be high on the list of disease targets and research funding. The relative cost of disorders would also be an appropriate factor to consider. In 2012 Genentech commissioned Milliman, an actuarial firm, to research the total annual costs of care of various disorders in the United States. The results of their analysis were published in Forbes magazine in 2012.2 . The most expensive disorder was not human immunodeficiency virus (HIV)-related, which cost $25,000 per patient per year, and was the 10th most expensive. Nor was it cancer which was ninth at an annual cost of $49,000 per patient per year. Nor was it, in ascending order of cost, organ transplantation, stroke, hemophilia, heart attack plus an invasive procedure, coronary artery disease, premature neonatology, nor end-stage renal disease which was second at $173,000 per patient per year. It was respiratory failure on a ventilator at $314,000 per patient per year, which was as much as the next 4 most expensive conditions combined. This is also the way many COPD patients end their lives. Mortality and cost are 2 very appropriate criteria where our attention should be directed, and by both those criteria, COPD should be very close to the top of our research agenda, if not the actual top. For every patient that physicians could avoid putting on a long-term ventilator, how many COPD patients could be given their own rehabilitation treadmill. Maybe 300? In comparing the number of ongoing COPD trials with those for other major disorders, using the search t erm COPD or emphysema or chronic bronchitis, there are 643 open studies on the ClinicalTrials.gov website. If one adds studies that are closed but still active, the total becomes 780. The number of active ongoing trials for other major disorders is shown, in ascending order in Figure 2. 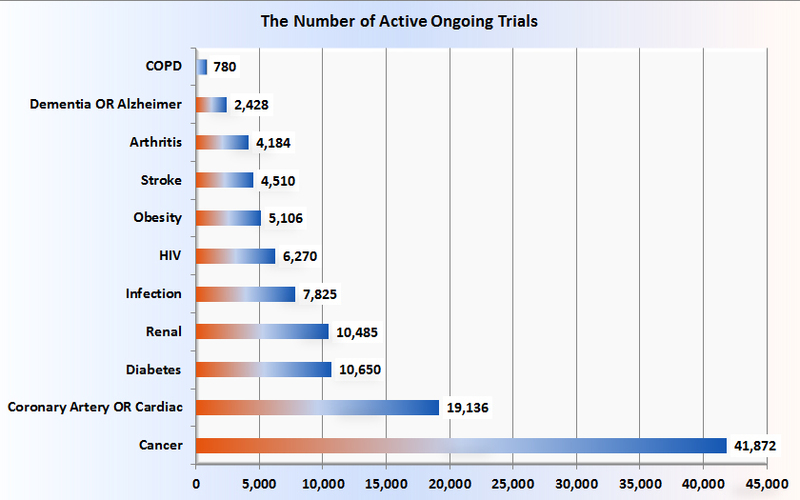 Compared with those numbers, COPD at 780 active ongoing trials seems disproportionately and inappropriately low. This unfortunate fact is attributed to, at least in part, the lack of a clear and detailed understanding of the pathobiology of COPD and the consequent lack of druggable targets. Fortunately, the above figures do not include the work that is being done in academic and pharmaceutical research labs, work that will one day be reflected in phase I studies, one hopes. The amount of these in toto is hard to estimate. A small portion of that preclinical work is reported periodically in my COPD Pipeline columns. It would be interesting to know the relative amounts of money devoted to research into COPD in comparison with other major disorders but those figures are not readily available. But the most common category of all, at 15% or 129 trials, was the category of agents that are based on long-acting beta agonists (LABAs), long-acting muscarinic antagonists (LAMAs), and inhaled corticosteroids (ICS), and combinations of these. This includes agents that are either well-known or of well-known classes, fixed combinations of which are being developed--the so-called me-too’s. Almost every conceivable permutation of these agents, encompassing onset and duration of action, delivery device and formulation is in trials, including some triple combinations. This also includes line extensions–these are searches for broader indications, or to tease out and emphasize features of an already approved agent. Upon review, no head-to-head trials of me-too’s were found. Also becoming more common are agents of the MABA type--single molecules with both muscarinic antagonism and beta-agonist moieties. There were a total of 129 me-too’s which, at 15% of all COPD trials, makes them by far the most common agents under development for COPD. The issue of whether so many agents that have such similar actions are needed will be left to the editorialists. An additional reason why clinical research into COPD seems deficient may be that there are not convenient and acceptable trial endpoints for the disease. All other major disorders have distinct and relevant endpoints, clinically-based or surrogate ones, which can be used to demonstrate the efficacy of a product. For COPD, there is lung function, which may not tell us anything about a drug’s ability to alter the natural history of COPD and which requires a 3-year or more trial with several thousand participants. These are daunting, risky and extremely expensive trials. The development and validation of biomarkers may improve the situation. Until then, one can expect industry to take the safe, predictable, well-travelled road and aim for a piece of the lucrative ICS-LAMA-LABA pie. One area of optimism is the enormous increase in the number of biologic agent trials in the last decade. From just double figures a decade ago, there were 907 biologics in development in 2013.4 Very few are in late stage development. More than one-third of them, 338, were of monoclonal antibodies, mostly for a cancer indication. Vaccines accounted for another 250. The total number for respiratory disorders was 38. Only 15 active and ongoing trials of a biologic agent are found under COPD. Their stated purposes are varied, from COPD vaccines to stem cell studies (including ones from Russia and Iran), novel proteinase inhibitors, and gene transfer. 2. Whelan D. The 10 most expensive common medical conditions. Forbes. Feburary 25, 2012. 3. Fitch K, Phyenson B; Milliman, Inc. Benefit designs for high cost medical conditions. Milliman Web site/ http://us.milliman.com/insight/research/health/Benefit-designs-for-high-cost-medical-conditions. Published April 2011. Accessed April 3, 2014. 4. Pharmaceutical Research and Manufacturers of America (PhRMA). Medicines in Development: Biologics, 2013 Report. PhRMA Web site. http://www.phrma.org/sites/default/files/pdf/biologicsoverview2013.pdf . Published 2013. Accessed March 15, 2014.